When my husband was laid off from his job a few years ago and we were struggling with money, I combed through every dollar in our budget and we changed everything about how we spent our money. One of the things I did during this time was to earn Amazon gift cards to help us pay for things like Christmas gifts. I was able to accrue a significant amount of cards, well over a couple hundred dollars worth! It was easy for me to earn Amazon gift cards through Swagbucks, and I highly recommend it. You can earn Swagbucks “points” and redeem them for the Amazon gift cards by doing simple things like using Swagbucks to search, just like you would use Google to search. That was the easiest thing for me to do, and I did it daily. In addition to using it for searches, you can also log in to your account and complete their surveys, watch video clips, print coupons, and more. Everything you do on their site is assigned a “point value” that you can use to earn gift cards to various places, including earn Amazon gift cards. It’s an easy and FREE way to stockpile points and earn Amazon gift cards! If you’d like to begin earning your own points and saving money, here’s the link to get started. Cook at home instead of eating out. We used to waste so much money going out to eat! This is a constant struggle for us as a busy family. Try a program like $5 Meal Plans to help you create simple, inexpensive meals at home if you struggle in this area like I do. You’ll save MORE money on your groceries each month than the $5 you pay for their service. Check out books and movies at the library. Our library has an extensive movie selection! If your family likes to rent movies, this is a good way to add to your savings. Avoid the video store and head to the library instead. Instead of spending money on entertainment like bounce houses, trampoline parks, etc. go outside and enjoy the outdoors! Take a family bike ride, hike through a county park, or enjoy free local events like art fairs. Switch your cell phone service to a low-cost, lesser known carrier such as Republic Wireless. One of their unlimited monthly cell plans is only $15 per month! Negotiate your seemingly “fixed” expenses. I do this every so often; I make phone calls to my internet provider, telephone carrier, or insurance company and tell them I’m tightening my budget. They usually find a better plan for me to switch over to and I end up shaving a few dollars off our monthly bill! Use a programmable thermostat so that you can heat/cool your home more efficiently. There are even “smart” thermostats now (like this one from Nest) that are totally amazing! Eliminate your cable TV bill. We haven’t had cable in probably ten years! We do watch some shows through our Amazon Prime account (<– this link takes you to a FREE 30-day trial) or by using a Roku box. Many news channels and sporting events are available to watch over the internet now, too. Find ways to earn side money from home, such as working as a virtual assistant to bloggers or by starting your own blog. Drink only water; no juice, pop, etc. Use less meat in your meals. Do you usually use one pound of beef in your stew? Taper it to a half pound instead. What other ways do you save money? 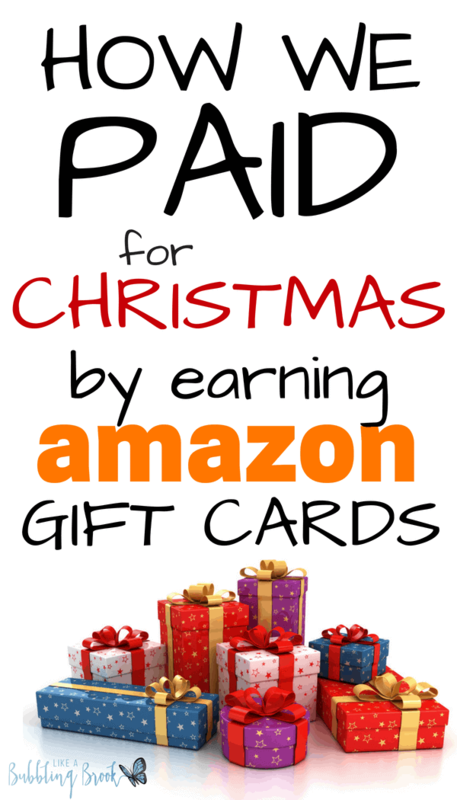 Have you found any other ways to earn Amazon gift cards?